I think, it would be ingratitude if i havent given here at least one article about a source of such an inspiration as culture ( specific fashion) of ancient Greece. Period of ancient Greece, which is certainly admired by lots of people ( not only me) is the period, when the clothes were serving to people and not people to the clothes.It is the period, when women became human nymphs, walking the ground. Even then Greeks understood the value of women¨s beauty so the clothing was just inornate and it only has to emphasize the natural proportions of women body. So tender beauty of women underlined just fine linen, which naturally coincided and developed their movements. It was really simple (almost not sewn), but also moldable and thus be able to dress with casual elegance, sophistication or sincere simplicity. The basis of all types of clothing was rectangular fabric strip. The clothing in general was CHITON. Chiton served as atunic, because women still wore PEPLOS on it. Peplos had been cut as the chiton and was long and wealthy frilling. He wore the fold and crease( which was made by it) served as the belly bag. dress showed social class, to which man belongs. For example: hard working workers, peasants wore a short and narrow chiton, which was switched only to the left shoulder. It called EXOMIS and looked differently as the picturesque chiton. 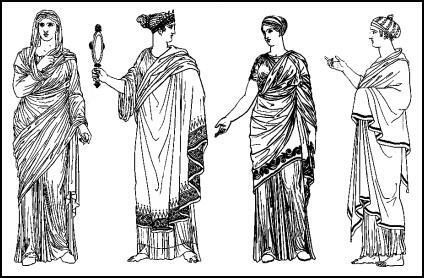 In Greece were also many types of cloaks, coats, which were miscellaneous arranging, but based on the basic fabric rectangle.They called CHLAINA, DIPLAX, CHLAMYS , but HIMATION too. I can’t seem to be able to reach this site from my smartphone!!! !